Building on years of incubator design, the all new Ovation 56 EX fully automatic digital egg incubator incorporates Brinsea's new "Induced Dual Airflow" system which achieves higher levels of temperature consistency for optimum hatching conditions. 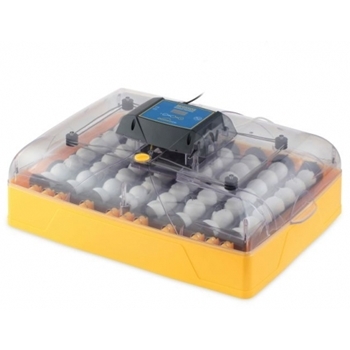 35 duck eggs is above the incubator auto-turner motor capacity. I have now downgraded to 30 eggs and I'm waiting to see if it is working now. In the end, I'll be left with non incubated imported duck eggs ($$$) that I tought would fit in (in fact they fit in, but it seems too heavy for the auto-turner). I now need to find an extra incubator in short notice since I received the eggs today. That's not what I expected from a product that was not cheap. I ordered my eggs based on the specs. The auto-heat and auto-humidity control seems to work fine. We have incubated 2 groups with this unit so far and have had a 93% hatch rate. Unit was easy to set up and program. For the water we are using a peanut butter jar I cleaned and drilled a small hole in the lid. I did notice that short piece of the tubing for the pump did not last as long as the manual suggests it should. I had to change it after the first batch. Will see now that batch 2 is done if I need to do it again. We now have over 100 chicks in brooders to pasture raise for meat, and will have a lot more before it's over. In all, very satisfied with this unit and would definitely recommend it.